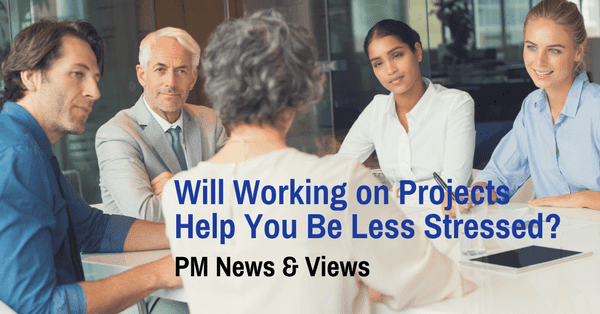 PM News and Views: Will Working on Projects Help You Be Less Stressed? Will Working on Projects Help You Be Less Stressed? I was talking with a business manager the other day about organizing a presentation for her group. She said, "It's always so hectic around here, people aren't so organized. Let's see if they have time to attend the session." I replied, "Well, there you go. Project management can help with that!" How can working with a project mindset help with organization? First, there's the defining of the project itself and its scope. What are we doing and not doing? Clarifying that will help keep focus and eliminate unnecessary efforts. Then there's the schedule. What has to be done next? Can someone else do part of the work concurrently to save time? Knowing what is to be done when can help reduce the running-around-with-the-head-cut-off routine. And there's risk analysis. What should we take care of now and what money can we put aside for in case uncertain events occur? Then we can rest assured we have taken care of the what-if's and what-may-happen and get on with the job. These are just a few examples of how organizing work into projects can reduce stress. But let's not forget communications – lack of proper communications can cause many headaches in a project. That's why identifying who is interested in the project, who can affect it positively and negatively, and how the stakeholders want to be communicated with, is so important. If we can define these things at the beginning of the project and keep an eye on them as we go along, we will have a stronger project.